The guys have done it! 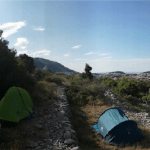 The Help For Heroes Walk is now complete with the team having visited Slovenia, Croatia, Bosnia, Montenegro, Albania, Macedonia, Greece, Turkey, and finally concluding in Cyprus (where they are planning a holiday!) Although a very long way, they have thoroughly enjoyed themselves and met loads of new friends along the way. 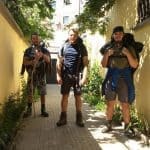 Out intrepid explorers Joseph Potts, Kristian Putman, and Harry Henderson must feel like heroes themselves having trekked over the mountainous terrain of Geneva in Switzerland to then head east across the north of Italy towards Milan. Then in the sweltering heat wave that’s hit this year, making their way through Greece, Turkey, and Cyprus with the mercury hitting over 40 degrees is quite a feat! They’ve also reached their goal of raising over £1000 for Help For Heroes, with an amazing £1402 being raised for this incredible cause. There’s no doubt they are feeling worn out after this journey, but we’re sure the relaxation in Cyprus will aid their recuperation. Meanwhile, if you’d like to increase the £1402 raised for Help For Heroes it’s not too late to show your support for all their hard work over this long, hot summer.